This summer, your favorite Marvel Super Heroes will join forces in Hong Kong Disneyland Resort for brand new adventures with Marvel Super Hero Summer. 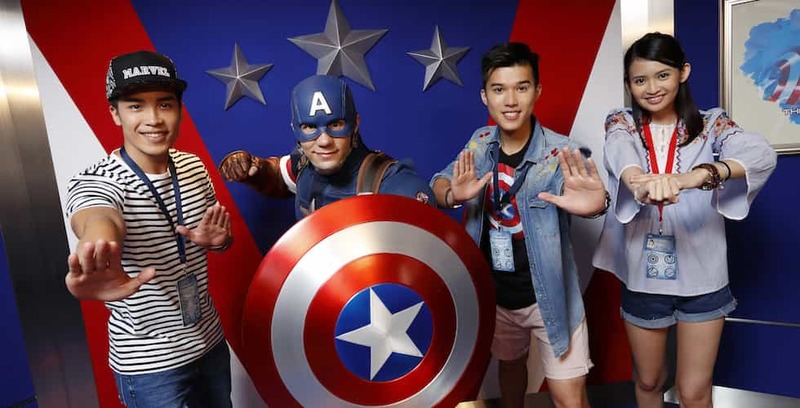 Since the launch of the Iron Man Experience, which has become a fan favorite in the park, the Marvel Universe has gained much popularity at the resort and has made Hong Kong Disneyland the Marvel hub for Asia. Now, more Super Heroes are gathering to fight the evil presence of Hydra during the Marvel Super Hero Summer event, now through Sept. 3. Guests can now join the Agents of S.H.I.E.L.D. on missions to help save the world. Starting with a personalized Agent ID, guests will join Captain America for “A Hero’s Welcome,” where he will welcome new recruits to the team. Agents can then meet the friendly neighborhood Spider-Man at the Spider-Man Heroic Encounter. Finally, guests can put their skills to the test by walking through the Mission: Dimensions of Danger attraction, where they join Super Heroes in a battle against evil forces through interactive experiences with Thor and Star-Lord from Guardians of the Galaxy. During the experience, Hawkeye and Black Widow will appear in Launch Bay while Thor resides in Odin’s Vault, and Star-Lord will join in on the challenge in the Collector’s Museum. The Super Heroes need guests to provide backup in their missions to help Doctor Strange recover the Portal Nexus artifact before it can be obtained by Hydra. Hong Kong Disneyland has also teamed up with Marvel to create a new limited-edition Marvel comic book, “Iron Man Experience: Hong Kong Heroes #1.” Printed copies are available for sale in the park only during Marvel Super Hero Summer. The Marvel team, with Hong Kong artist Justice Wong and writer Howard Wong, spent two months creating the comic. Set in Hong Kong, the comic introduces a new armored hero who joins Iron Man and the other heroes to stop the villains from stealing a hidden treasure inside the Stark Expo in Hong Kong. Guests with S.H.I.E.L.D. Agent Credentials and ID can take advantage of a 20 percent discount on the limited edition comic after they have completed specific missions and earned all four Medals of Valor in the park. Marvel merchandise will also be available, with nearly 300 Marvel-themed products in the Marvel Supply HQ. Some of the items include t-shirts, toys, stationery, and even a green-screen photo to make guests become their own Marvel Super Heroes. Marvel-inspired food and beverage options will also be available for guests to fuel up during their missions, including a Hero Burger Combo at Stark Kitchen; and desserts and drinks like the Hero’s Shield, Super Hero Cotton Candy and the Super Hero Jelly Cup. Guests can also recharge their super strength during a hotel stay with the Iron Man Room Decoration package for HK$600 now through the end of December. The option is available in any of the resort’s three hotels, and turns the room into Iron Man’s headquarters with a special bed runner, door and mirror stickers, slippers, and Iron Man-themed macarons. After the fun of Marvel Super Hero Summer ends, guests can look forward to the Marvel 10K Weekend 2017 in mid-September. During the race, Spider-Man, Captain America, Thor and other Marvel Super Heroes will cheer the runners on as they race through the 10K. For more information on Marvel Super Hero Summer or to plan your stay, visit hongkongdisneyland.com. Check out the preview video for Mission: Dimensions of Danger below.